"coconut Bay" Rawai, Phuket, Thailand !!! 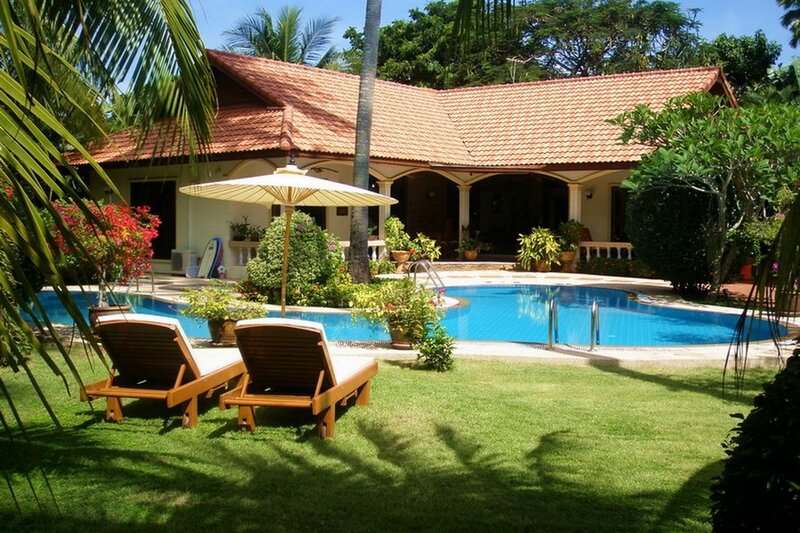 “COCONUT BAY” is a Fabulous Spacious 4 Bedroom, 4 Bathroom Villa Sleeping 8/10 people and is set around a Stunning Pool wandering through the Coconut Trees in a Beautiful Peaceful Tropical Garden. The Accomodation includes a Master Bedroom Opening onto the Arched Terrace and Overlooking the Pool. The Master Bedroom has a Kingsize Bed and En-Suite Bathroom, Bedroom 2 also opening onto the Arched Terrace Overlooking the Pool has a Kingsize Bed and En-Suite Shower Room. Bedroom 3 is Overlooking the Garden, has Twin Beds and use of the General Shower Room. Bedroom 4 is Overlooking the Garden and is a Self Contained Annexe but also connected and Accessible from the Villa. This Bedroom has Twin Beds, Small Kitchen Area with Fridge, Microwave, Tea / Coffee Making and En-Suite Shower Room. The Villa has a Spacious Open Plan Living Room and Kitchen all Opening onto the Large Arched Terrace which is Perfect for Al-Fresco Dining Overlooking the Beautiful Pool and Gardens. The Whole Living / Kitchen Area has Sliding Patio Doors on Both Sides giving a Cool Flow of Air through the Villa. The Living Room has a Flat Screen TV, DVD and CD Players, The Kitchen has Oven with Extractor Hood, Microwave, Fridge / Freezer, Dishwasher and all other essential Equipment. The Villa has a Laundry Room with automatic Washing Machine, Iron, Ironing Board and Safe. There is also a 3 Station Multi Gym in the Car Port Area for Keeping in trim on Holiday. The Villa has Wi-Fi Internet, Moblie Phone with Local Sim Card, TV's Ceiling Fans, Fly Screens and Full Air Conditioning Throughout. There are Comfortable Sun Loungers for Relaxing by The Pool. Comfortable Sun Loungers for Relaxing by The Pool. We Offer a Full and Personal Guest Service Including Arranging your Airport Transfer and Car or Motorbike Hire which can be waiting at your Villa on Arrival, We have our own Tour Specialist who can Advise you and Book any Tours, Excursions, Boat Trips to other Islands etc. We can Book Massage for you in the Privacy of your Own villa and we also offer Free Delivery of Meals, Wines etc. from our own Excellent Bar and Restaurant on Rawai Beach Front. "COCONUT PARADISE HOLIDAY VILLAS" Offer complete Flexibility for your Special Holiday. We can Accomodate up to 56 Guests in a Collection of Beautiful Private Pool Villas which can be perfect for Couples, Families, Large Family or Friends Get Togethers, Special Occasions, Special Birthdays, Honeymoons and Wedding Parties. All Villas are furnished to a high standard with Full Air Conditioning, Fully Equipped Kitchen, TV, DVD/CD Player, Telephone and Wi-Fi Internet Throughout. They are also Children and "Toddler Friendly". We can provide Cots, High Chairs, a Children's DVD Library and also a Baby sitter. We can provide Packages for Special Occasions, Special Birthdays, Anniversaries, Honeymoons and also Complete Wedding Packages. Please ask if you would like more information.